The woodlouse has a shell-like exoskeleton, which it must progressively shed as it grows. The molt takes place in two stages; the back half is lost first, followed two or three days later by the front. This method of molting is different from that of most arthropods, which shed their cuticle in a single process. A female woodlouse will keep fertilized eggs in a marsupium on the underside of her body until they hatch into small, white offspring. The mother then appears to “give birth” to her offspring. Some species of woodlouse are able to roll into a ball-like form when threatened by predators, leaving only their armored back exposed. This ability, or dominant behavior, explains many of the woodlouse’s common names. 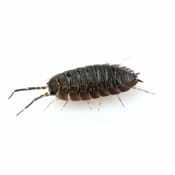 Woodlice need moisture because they breathe through gills, called pseudotrachea, and so are usually found in damp, dark places, such as under rocks and logs. They are usually nocturnal and are detritivores, feeding mostly on dead plant matter, although they have been known to feed on cultivated plants, such as ripening strawberries and tender seedlings. Woodlice then recycle the nutrients back into the soil. In artificial environments such as greenhouses where it can be very moist, woodlice may become abundant and damage young plants. Treatment starts with a thorough inspection for the primary source of the infestation and any conducive conditions. After that recommendations are made for good sanitation practices and/or elimination of conducive conditions. Then a pesticide application maybe preformed when necessary.